Kurt Snibbe/ESPN.com The Steelers have managed to stay in the limelight with a closet full of skeletons. Two years ago the Pittsburgh Steelers were on their way to an unprecedented sixth Lombardi trophy and, after a brief encounter with Dan Rooney, the team's humble and magnanimous owner, I wondered, in this very space, if the Steelers were, in fact, the greatest franchise in sports. Purchased by Art Rooney Sr. in 1933 with $2,500 he supposedly won at the track, the Steelers initially struggled for decades. But since the AFL-NFL merger in 1970, no team has been better. Maybe not in any sport. In those 41 seasons, the Steelers have been in 22 divisional playoffs and 15 conference championships, including eight in the past 14 seasons. They've been to eight Super Bowls and won six -- with a shot at No. 7 next week in Dallas. The Steelers have 20 Hall of Famers and a rabid, worldwide fan base, and their logo has become one of the most recognized and respected icons in the entire sports world. They have a scouting department, a coaching legacy and a front office that's the envy of the entire league, as well as a remarkable, tireless connection to dozens of local and national charities. And so, with apologies to the Montreal Canadiens, the Yankees and the Celtics, after factoring the parity and popularity of the NFL, as well as the social impact of the Rooney Rule, I'd still give the nod to the Steelers. The Pittsburgh Steelers are the greatest franchise in sports. But you know what I've learned while covering this team, extensively, during the past 15 years? They also might be one of the dirtiest. It's something we all might want to consider over the next 10 days as a nation of pundits blather on about the wholesome, blue-collar, old-fashioned, long-lost American goodness that the Steelers (or any other sports teams) represent. Now, I'm not just talking about the well-documented, but unproven, accusations of sexual assault against Ben Roethlisberger that earned the Steelers' QB a four-game suspension this season; the $125,000 the league has fined linebacker James Harrison for illegal hits this season; the blocks by Hines Ward that earned him the rep as one of the game's dirtiest players and inspired the creation of the "Hines Ward Rule" against blindside blocks; or, even, the 13 arrests the Steelers have logged since Super Bowl XL (compared to, say, the Packers, who have had five players arrested during the same time frame), according to a database run by The San Diego Union-Tribune. This is just the latest example of a sinister side to the Steelers that has run parallel to the team's phenomenal success during the past 41 years. To be sure, this isn't ticky-tack stuff like parking tickets and training camp curfew violations. These are reports, allegations or documented instances of shooting at cops, assaults against women, drugs, deadly high-speed car chases and suicides -- as well as repeated questions about performance-enhancing drugs. None of it, a secret. Yet the bigger question, at least to me, is that through it all our love and admiration for the Steelers has only continued to grow. Even die-hard Steelers fans who are, no doubt, turning apoplectic at this point, have to admit it's a remarkable paradox -- our best, most beloved team is also one of the dirtiest? It offers a fascinating glimpse into the soul of this sport and those who love it. Part of the problem is that to justify the time and energy we all spend on sports, we try to attribute some grand, mythical, moral undertones to events like the Super Bowl when, the truth of the matter is, off-the-field character in the NFL has little or no effect on on-field performance. Heck, it might even be a detriment. As one respected NFL veteran told me, "You can't win in this league with 53 choirboys." That's never been the Steelers' problem. They work the margins and push the envelope and walk the line as well as any team. And in a violent, uber-competitive league like the NFL, that's a virtue, not an indictment. The last time I checked, they weren't holding parades for 2-14 teams full of Boy Scouts. "It's not all roses with this team, but there's just something about the Steelers uniform that deflects the negative," says Chad Millman, a colleague of mine at ESPN The Magazine and co-author of "The Ones Who Hit The Hardest: The Steelers, the Cowboys, the '70s and the Fight for America's Soul." "They've always walked that fine line. It might be cheap or dirty, but with the Steelers it's always framed as a virtue done in the name of winning. There's just so much iconic, mythical, blue-collar character associated with this team that it's hard for people to see the negative." That doesn't mean it's not there, though. In fact, Millman's book traces the Pittsburgh Paradox back to its exact origin: defensive end Ernie Holmes. "I think he wanted to beat people to death -- within the rules of the game," former Steelers safety Mike Wagner says of Holmes in the book. Somewhere, I bet, a sweet little old granny in Pittsburgh is stitching that motto onto the back of her Terrible Towel. In March 1973 Holmes, who was later diagnosed as suffering from acute paranoid psychosis, allegedly pulled a shotgun from his truck while driving on the Ohio turnpike and began shooting out the tires of passing trucks. This led to a high-speed chase, a shootout and a standoff with state police that ended in a nearby forest with Holmes allegedly shooting an officer in the ankle. Two days later, a lawyer paid for by the Rooneys bailed Holmes out of jail using $45,000 supplied by the Rooneys. He was then taken to a psychiatric hospital (also paid for by the Rooneys) where he stayed for two months. When he got out, Holmes pleaded guilty to assault with a deadly weapon and, somehow, was given five years probation. (Just trying to imagine how something like this would play out in 2011 is mind-blowing, isn't it?) A few months later, though, Holmes was back at training camp and in the starting lineup, where he helped the Steelers win their first two Super Bowls. Art Rooney Jr. said Holmes needed "mercy." Of course, the Steel Curtain also needed a defensive end. Either way, the lines had officially been blurred and the Pittsburgh Paradox had begun. Pittsburgh, of course, went on to win four Super Bowls in the 1970s. It was a dynasty like no other that included some of the greatest, baddest football teams ever assembled. Pictures from this era dot the inner hallways of the team's practice facility and, if you're not careful you will get lost while gazing at floor-to-ceiling photos that feature Jack Lambert growling above a prostrate Fran Tarkenton. The end of the Steelers' amazing run in the 1970s came a full decade before the NFL banned steroids. Nevertheless, there has been widespread speculation that the first part of the Steelers' dynasty is tainted in some way by the fact that it helped popularize steroid use in the NFL. In the 1991 book "False Glory: The Steve Courson Story," the former Steelers offensive lineman wrote that 75 percent of the offensive linemen on the Steelers' Super Bowl teams in the late 1970s had used steroids. Steroid use was, after all, not banned by the league at the time, and I wonder if the spotlight has fallen on the Steelers largely because they were so damn good. Not everyone agrees, though. "It started, really, in Pittsburgh," Jim Haslett said in 2005 while coaching the New Orleans Saints. "They got an advantage on a lot of football teams. They were so much stronger [in the] '70s, late '70s, early '80s. They're the ones who kind of started it." The Steelers challenged this statement, of course, but the ramifications -- and suspicions -- linger. A 2009 investigation by ESPN into the Steelers' history with performance-enhancing drugs found an alarming number of former players suffering from heart ailments. "Even if there is no pattern or clue linking the deaths to steroids," wrote the article's author, Mike Fish, "since 2000, 17 former Steelers have died before they reached the age of 59." Still think this is all sensationalist anti-Steelers crap? That list includes former Steelers guard Terry Long, who tried to kill himself with rat poison after testing positive for steroids in 1991. He died in 2005 after drinking antifreeze. A year before Long died, Steelers offensive linemen Justin Strzelczyk was killed in a fiery head-on collision with a tanker truck after leading New York state troopers on a 40-mile chase. Hall of Fame center Mike Webster died from heart failure in 2002 at the age of 50, tormented by years of dementia, drug use and homelessness. Are there troubled souls and tragic accidents on every NFL team? Yes. Do most great teams have a dark side? Uh, look at the Dallas Cowboys. Yikes. I've probably done 50 stories on the Steelers in the past 15 years. I've traveled in Switzerland with Roethlisberger, hung out in Alabama with Kevin Greene, played golf with Dermontti Dawson, even had a civilized conversation with Greg Lloyd. My personal experience has been unequivocal: This is a class organization from top to bottom. But in the next two weeks, the Steelers could become the most accomplished and important franchise in sports. And, like it or not, this is all part of their remarkable story. At the heart of Fish's 2009 investigation was the revelation in 2007 that Dr. Richard Rydze, a longtime member of the Steelers' medical staff, had been questioned by federal authorities after supposedly using a personal credit card to purchase six-figures worth of human growth hormone. According to published reports, Rydze said he purchased the HGH for his elderly patients. His ties to the team were cut four months after his name was identified in news reports. There was no proof that Rydze ever provided the drug to players. This incident was followed by off-the-field problems involving, among others, Santonio Holmes, Jeff Reed and Roethlisberger. Holmes was traded to the Jets before the season and Reed was cut in November. Among the many admirable qualities of the Steelers, and especially the Rooney family, is the club's habit of cutting loose troublemakers in a league normally governed by a sliding scale of morality. This one trait might also get to the root of why we are so eager to look the other way when it comes to the Pittsburgh Paradox. Winning cures everything, no doubt. Especially in the NFL. It's also because the face and the heart of this franchise will always belong to people like Mike Tomlin, Jerome Bettis, Terry Bradshaw, Franco Harris and Jack Ham. In the final analysis, the good in Pittsburgh outweighs the bad. And that has a lot to do with the men and the family that have run the team since its inception: the Rooneys. "It's easy to hate Jerry Jones, it's easy to hate Al Davis, it's easy to hate Dan Snyder," says Millman. "But the Rooneys are so decent and they have built up so much goodwill, it's hard not to root for them and hard for fans not to believe they're not trying to hurt anyone or do anything wrong -- they're just trying to win Super Bowls." Which, I suspect, is exactly what's going to happen again next Sunday. 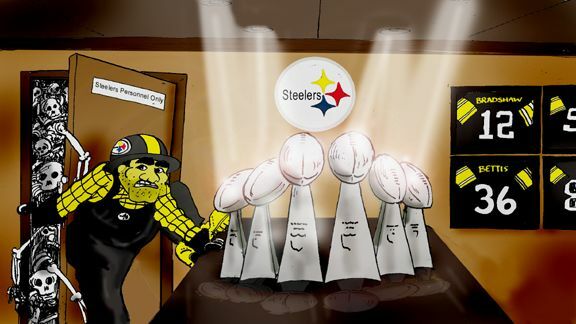 If you're trying to draw attention away from your dark side, seven shiny Lombardi trophies will probably do the trick.